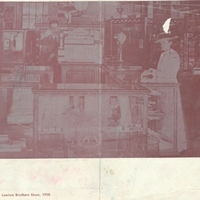 A photograph of the Lawton Brothers Store in Oviedo, Florida, in 1910. 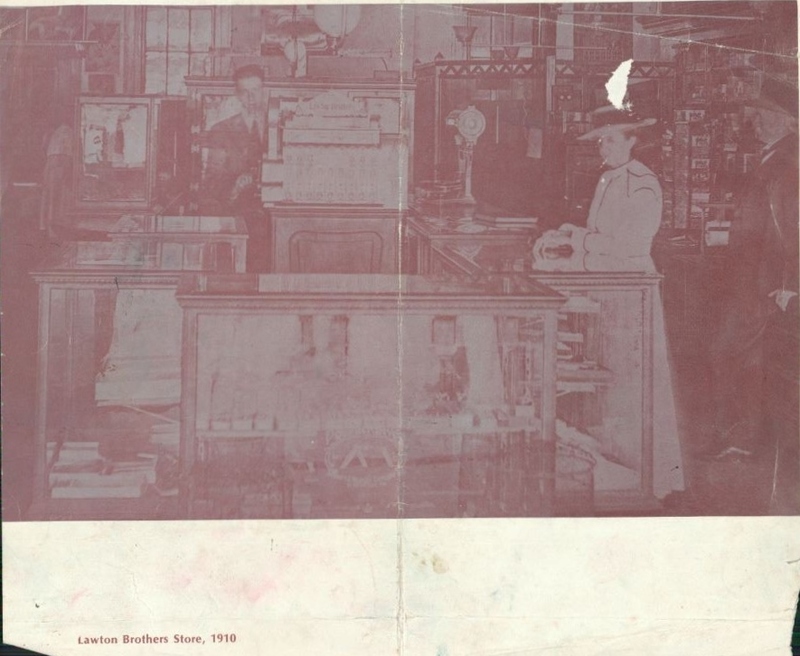 The man behind the cash register in the photograph is likely Thomas Willington Lawton (1882-1963) or his brother, Winborn Joseph Lawton, Sr. (1881-1971). T. W. Lawton graduated from Rollins College in 1903. He later received his master's degree from Andover Newton College in Boston, Massachusetts. Following college, Lawton returned to Oviedo, where he married Charlotte "Lottie" Lee (1887-1984) and served as the principal of the Oviedo School from 1905 to 1907. In 1916, he became the first elected Superintendent of Schools of Seminole County. He held that post until 1952 and passed away 11 years later in 1963. Lawton Elementary School is named in his honor. W. J. Lawton, Sr. served as a trustee of the First Baptist Church of Oviedo, as well as a secretary and treasurer for the church's Sunday school. He graduated from Mercer University in Macon, Georgia, in 1900. Lawton married Lillian Della Lee (ca. 1883-1977) and had four children: Elizabeth Lawton Laney, Kathryn Lawton, John. K. Lawton, and Winborn Joseph Lawton, Jr. Lawton was in the mercantile business, worked as an insurance agent, and grew citrus. Original black and white photograph: Private Collection of Bettye Reagan. general store; hardware; Lawton General Store; Oviedo; retail; shop; store; T. W. Lawton; Thomas Willington Lawton; W. J. Lawton, Sr.; Winborn Joseph Lawton, Sr.
“Lawton Brothers Store, 1910.” RICHES of Central Florida accessed April 25, 2019, https://richesmi.cah.ucf.edu/omeka/items/show/6357.